SEATTLE — NASA confirmed Jan. 10 that an uncrewed test flight of SpaceX’s Crew Dragon spacecraft will now take place no sooner than February, due at least in part to the ongoing government shutdown. In a statement, NASA said it was “targeting no earlier than February” for the mission, known as Demo-1 or DM-1. The agency had previously announced a Jan. 17 date for the mission, launching from the Kennedy Space Center. NASA, in its statement, said that the rescheduled launch provides additional time “to complete hardware testing and joint reviews” but did not elaborate. While not explicitly stated, the ongoing partial government shutdown, which has furloughed about 95 percent of NASA’s civil servant workforce since Dec. 22, likely also played a role because personnel needed for reviews and other mission support are not working. SpaceX rolled out the Falcon 9 rocket and Crew Dragon spacecraft for DM-1 to Launch Complex 39A on Jan. 3, moving the rocket to the vertical for testing there. The company hasn’t updated the status of that testing or stated if the vehicle would have been ready to support a Jan. 17 launch if the government was operating normally. DM-1 is the first of two commercial crew test flights planned by SpaceX. On DM-1, the spacecraft, with no astronauts on board, will test out its systems in orbit and visit the International Space Station before returning to Earth. That will be followed by DM-2, which will carry NASA astronauts Bob Behnken and Doug Hurley on a mission to the ISS. DM-2 is scheduled for launch in June according to schedules most recently updated in November, prior to the latest delays in DM-1. Boeing, the other company developing commercial crew vehicles, has an uncrewed test flight of its CST-100 Starliner vehicle scheduled for March on a United Launch Alliance Atlas 5. 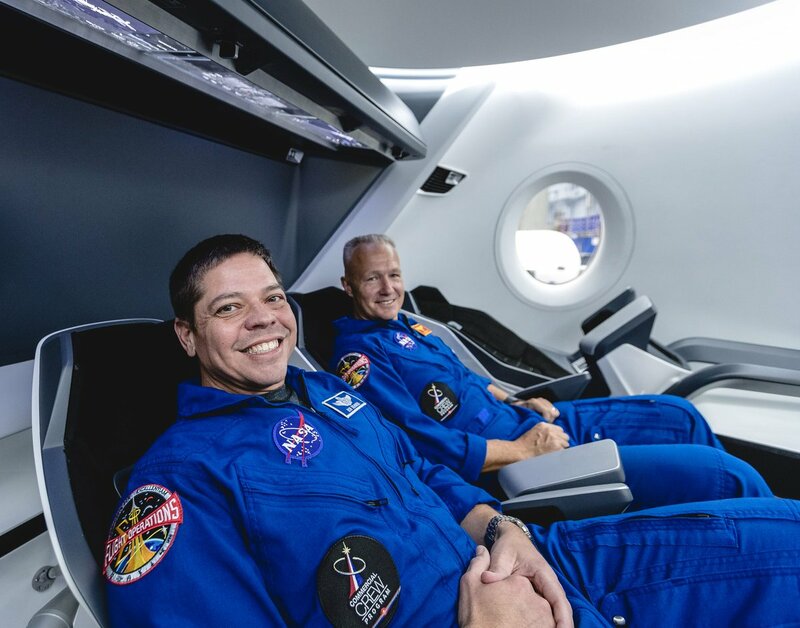 That will be followed by a flight carrying NASA astronauts Eric Boe and Nicole Aunapu Mann, and Boeing test pilot Chris Ferguson, in August 2019. 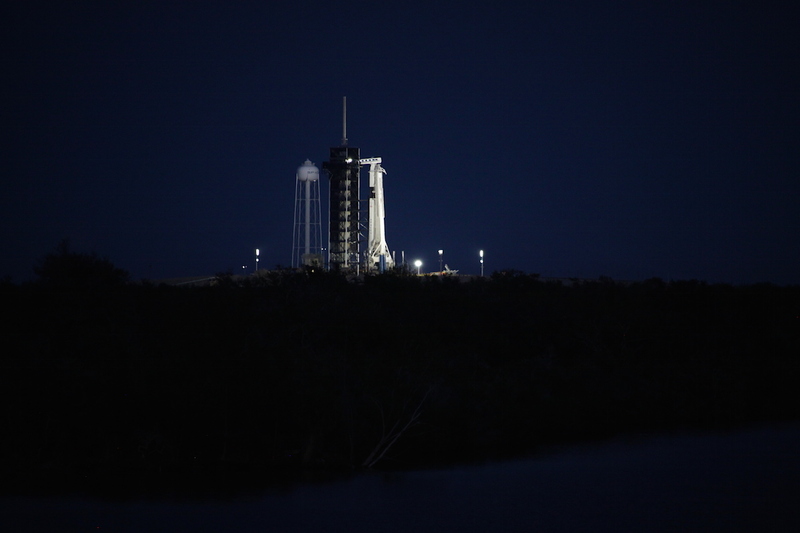 It has been nearly a month since SpaceX conducted a test fire of the Falcon 9 rocket which will launch the first Crew Dragon, and today’s NASA Flight Readiness Review at Kennedy Space Center in Florida concluded with a GO to proceed with a launch attempt as soon as 2:48am EST on Saturday, March 2. Last month’s test fire marked the first time a crewed vehicle and ground systems were integrated together on pad 39A since space shuttle Atlantis last soared on the STS-135 mission almost 8 years ago. The upcoming launch, Demo-1, will send the spacecraft on an uncrewed orbital shakedown & validation flight test to and from the International Space Station. And if the weather and schedule holds, the launch will make for a spectacular sight visible not only across much of Florida, but up a good portion of the East Coast too. “While the review was ongoing, crew members on station utilized a computer-based trainer and reviewed procedures to refresh themselves with the Crew Dragon spacecraft systems, rendezvous and docking, ingress operations, changes to emergency responses, and vehicle departure,” added NASA. The stakes are high. The agency’s need to end America’s reliance on Russia and have a homegrown crewed capability again is already years behind, and SpaceX and Boeing are competing for truly historic bragging rights to be the first to do it. If all goes well for SpaceX on DM-1, it will clear the way to launching another critical (and mandatory) flight test this spring, the Crew Dragon Ascent Abort Test. When astronauts begin launching to space aboard Crew Dragons and Falcon 9s, they will need an abort capability, not only to quickly escape an incident on the launch pad, but to escape an exploding rocket mid-air during launch and ascent too. Such a need isn’t just critical, it is required by NASA, and was proven why in a scary incident a few months ago when the crew of Soyuz MS-10 experienced a failure with their rocket, forcing them into a dangerous high-G ballistic descent back to Earth. The same capsule for DM-1 will fly the abort test, from the same pad, atop the rocket which just launched SpaceIL’s moonlander (the rocket’s third flight). 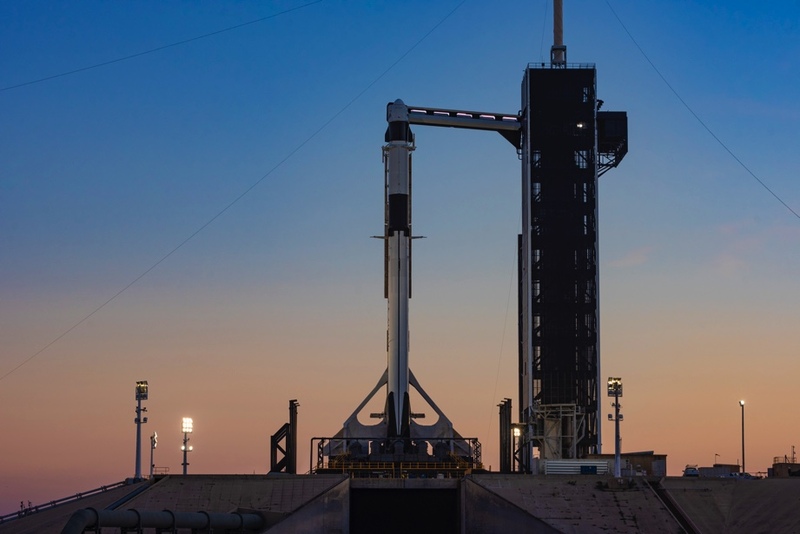 DM-1 will provide key data on the Falcon 9 rocket and Crew Dragon’s performance, the supporting ground systems, as well as on-orbit, docking and landing operations, ahead of the first Crew Dragon flight test on DM-2. It will spend about five days attached to the ISS and remain until March 8, when it will then return to Earth with critical research samples. About five hours after Dragon leaves the station, it will conduct its deorbit burn, which lasts up to 10 minutes. It takes about 30 minutes for Dragon to re-enter the Earth’s atmosphere and splash down in the Atlantic Ocean. A suited-up ‘dummy’ will also be onboard the Demo-1 mission, which will be instrumented and monitored for data on how the flight would have affected a crew physically. Roll out to the pad scheduled for Feb 28. The rocket will also land offshore on a SpaceX Autonomous Spaceport Droneship (ASDS), not on the Cape at ‘Landing Zone-1’, because SpaceX wants to reserve the rockets full margin on the test flight. Dragon will splashdown about 200 miles offshore from the launch site, where a SpaceX recovery ship will be waiting. Only after completing both DM-1 and the Ascent Abort Test, will NASA give SpaceX the GO to fly America’s first astronauts from U.S soil since Atlantis, later this year on Demo-2 (DM-2) mission. SpaceX has since 2012 launched cargo for NASA to and from the ISS under contract for the agency’s Commercial Resupply Services. In September 2014 NASA awarded a $2.6 billion Commercial Crew Transportation Capability (CCtCap) contract to SpaceX to demonstrate delivery of crew to and from ISS. Both commercial resupply and crew are part of NASA’s efforts beginning in the early 2000’s to stimulate development of privately built and operated American-made space vehicles for transporting astronauts to and from the ISS. In the small hours of Saturday morning (2 March), a decade-long effort to restore U.S. human spaceflight launch capability to American soil for the first time since the end of the Space Shuttle era will take a significant step forward, as SpaceX and NASA deliver the first Crew Dragon on an unpiloted test-flight to the International Space Station (ISS). Liftoff of the 230-foot-tall (70-meter) Falcon 9 booster is targeted for 2:49 a.m. EST, promising to turn night into day, figuratively and literally, on America’s human spaceflight aspirations. Assuming an on-time launch, the Demo-1 spacecraft will autonomously dock onto International Docking Adapter (IDA)-2, at the forward end of the space station’s Harmony node, at 6:05 a.m. EST Sunday, 3 March. It will remain attached to the ISS for a few days, with undocking, deorbit and parachute-aided splashdown in the Atlantic Ocean on the 8th. Although SpaceX has much heritage with the cargo variant of its Dragon spacecraft—having successfully launched 16 missions to the ISS between May 2012 and last December—the Crew Dragon has proven a far different concept to bring to maturity. As outlined in yesterday’s AmericaSpace article, SpaceX initially won funding to develop its spacecraft in April 2011, when it received $75 million from NASA through the Commercial Crew Development solicitation process (CCDev). The Hawthorne, Calif.-headquartered launch services organization was then selected as a Commercial Crew integrated Capability (CCiCap) finalist in August 2012, before being picked alongside Boeing for the coveted Commercial Crew transportation Capability (CCtCap) contracts in September 2014. Under the terms of those contracts, SpaceX and Boeing would each fly a piloted test-flight and at least two long-duration crew-rotation flights to the ISS, known as “Post-Certification Missions” (PCM). At that time, it was hoped that the first flights of SpaceX’s Crew Dragon and Boeing’s CST-100 Starliner might occur as soon as late 2017, but a multitude of technical and funding problems conspired against the Commercial Crew Program. Only months after the CCtCap decision, in May 2015 SpaceX triumphantly completed a rapid Pad Abort Test (PAT) of a mockup Crew Dragon from Space Launch Complex (SLC)-40 at Cape Canaveral Air Force Station, Fla. As detailed by AmericaSpace at the time—through a two-part history/review article and portfolio of imagery—the 102-second test saw Crew Dragon boost itself away from a ground-level platform and achieve a peak altitude of 3,561 feet (1,187 meters), under the 120,000 pounds (54,400 kg) of thrust afforded by the eight SuperDraco thrusters mounted in its sidewalls. 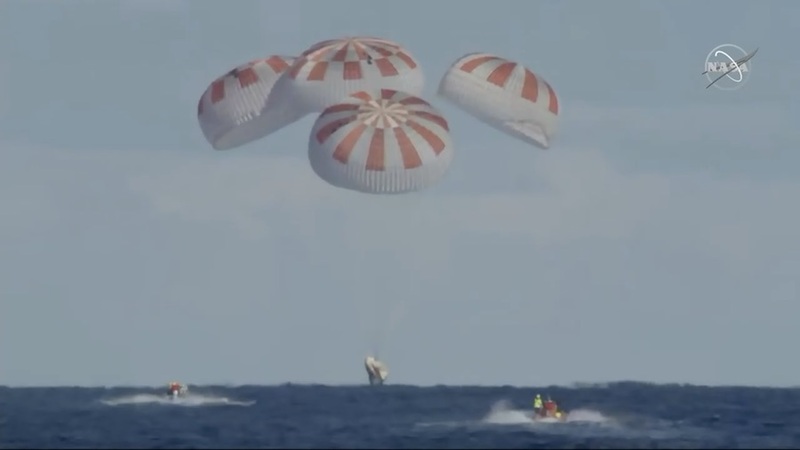 As planned, Crew Dragon’s pressurized capsule (inhabited by a heavily-instrumented crash-test dummy) separated from the unpressurized trunk at altitude, before descending to a splashdown in the Atlantic Ocean under three red-and-white parachutes. The sheer speed of the PAT, and the power of the SuperDracos—which can provide emergency crew-escape capability whilst on the pad during Falcon 9 engine ramp-up and at all phases of ascent, through second-stage flight, thereby ensuring no “black zones” in terms of survivability—was not lost on AmericaSpace’s Mike Killian and John Studwell, who observed, photographed and documented the May 2015 exercise. “I was forced to frame the remote cameras ‘wider’ than usual, just to give myself more chance of actually capturing a shot or two of Dragon getting off the pad,” Mr. Killian told me at the time. Added Mr. Studwell: “With a rocket, those first five seconds or so is a slow ascent, but Crew Dragon…will jump off and be at altitude and near engine cutoff in the same amount of time. Since there is a delay between the sound-trigger and the camera’s first shot, and considering the one second Dragon will be in frame of the remotes, I’m hoping just to get anything!” AmericaSpace’s PAT imagery portfolio can be found here. However, Congressional underfunding of the Commercial Crew Program, which led to thinly-veiled disgust from then-NASA Administrator Charlie Bolden, forced continued reliance upon Russia to provide seats aboard its Soyuz vehicles to transport U.S. astronauts to the space station during the gap in U.S. launch capability. By April 2017, the very year that Commercial Crew should have begun flying its inaugural missions, as much time had elapsed since the last shuttle mission as had previously passed between the return of Apollo-Soyuz in July 1975 and the first flight of the shuttle program in April 1981. Waiting for Commercial Crew to come online, in other words, would yield a far longer “gap” than ever before in U.S. human spaceflight history. Assuming that veteran NASA flyers Doug Hurley and Bob Behnken launch this coming July, a full eight years will have elapsed since America last launched humans to space from its native soil. A month after the completion of the PAT, in June 2015, SpaceX was awarded a $30 million milestone payment from NASA as part of its CCtCap certification. And only weeks after that, in July, NASA formally identified veteran astronauts Suni Williams, Doug Hurley, Eric Boe and Bob Behnken as the first members of a Commercial Crew “cadre” to support the continuing development and testing of both Crew Dragon and the CST-100 Starliner being built by the other CCtCap contract finalist, Boeing. In November 2015, NASA awarded SpaceX the first of its guaranteed PCMs, followed by a second in July 2016. However, the targeted maiden launch in late 2017 had fallen increasingly into doubt. “If NASA does not receive the full requested funding for CCtCap contracts in fiscal year 2016 and beyond,” it was cautioned, “the agency will be forced to delay future milestones for both U.S. companies and continue its sole reliance on Russia to transport American astronauts to the space station.” Nevertheless, progress continued and in August 2016 Expedition 48 spacewalkers Jeff Williams and Kate Rubins installed the Boeing-built IDA-2 onto the forward end of the station’s Harmony node, ready to receive its Commercial Crew visitors in due course. Last August, with significant fanfare, Vice-President Mike Pence—who also chairs the revitalized National Space Council—announced the names of nine veteran and first-time astronauts to fly the Crew Dragon and CST-100 Starliner piloted test flights and the first PCMs for both organizations. Doug Hurley and Bob Behnken, both of whom have logged two previous spaceflights during the shuttle era, would ride the first piloted Crew Dragon, whilst former shuttle commander and Boeing test pilot Chris Ferguson and NASA flyers Eric Boe and Nicole Mann would crew the first piloted Starliner. Rounding out the group, astronauts Mike Hopkins and Victor Glover would fly the first SpaceX PCM and Suni Williams and Josh Cassada would do likewise for the first Boeing PCM. Assignments were updated last month, however, when Boe was removed from his slot, due to a medical issue, and replaced by seasoned shuttle and ISS veteran Mike Fincke, who was until recently assistant to the chief of the Astronaut Office for Commercial Crew. Fincke’s former role has been taken up by Boe. In the dying weeks of 2018, for the first time, a definitive target date was set for Demo-1, although hopes of launching in January 2019 ultimately came to nought. Yet the program was close to fruition and the 230-foot-tall (70-meter) Upgraded Falcon 9 booster was transported to Pad 39A and its nine Merlin 1D+ first-stage engines were successfully test-fired on 24 January. Launch was provisionally rescheduled for late in February, with fears of a slight slippage into early March. At last week’s Flight Readiness Review (FRR), NASA and SpaceX officials expressed their satisfaction that, at long last, all systems were ready to go. Speaking at the post-FRR media conference, NASA Commercial Crew Program manager Kathy Lueders recalled a recent walk out to the pad and the spacecraft with Hurley and Behnken and a dawning realization that years of effort—and more than a fair share of frustration, no doubt—were about to pay off. EDITOR’S NOTE: Updated at 7 p.m. EST (0000 GMT) with additional photos, after the Falcon 9 rocket was raised vertical at pad 39A. The launcher was visible heading up the ramp to pad 39A shortly after 10 a.m. EST (1500 GMT) Thursday, once low-level fog began lifting at the Florida spaceport. The strongback transporter lifted the 215-foot-tall (65-meter) rocket vertical around 6 p.m. EST (2300 GMT) for final cargo loading and checkouts. Liftoff is scheduled for 2:49 a.m. EST (0749 GMT) Saturday from Florida’s Space Coast, when Earth’s rotation brings pad 39A under the space station’s orbital plane, allowing the Crew Dragon to reach the research outpost in a little more than a day. NASA and SpaceX officials met Wednesday for a launch readiness review, the last in a series of formal discussions on the status of the Crew Dragon, the Falcon 9 rocket, and the International Space Station, the mission’s destination. Mission managers decided to proceed with launch preparations, after a previous flight readiness review Feb. 22 gave a preliminary “go” for the flight. 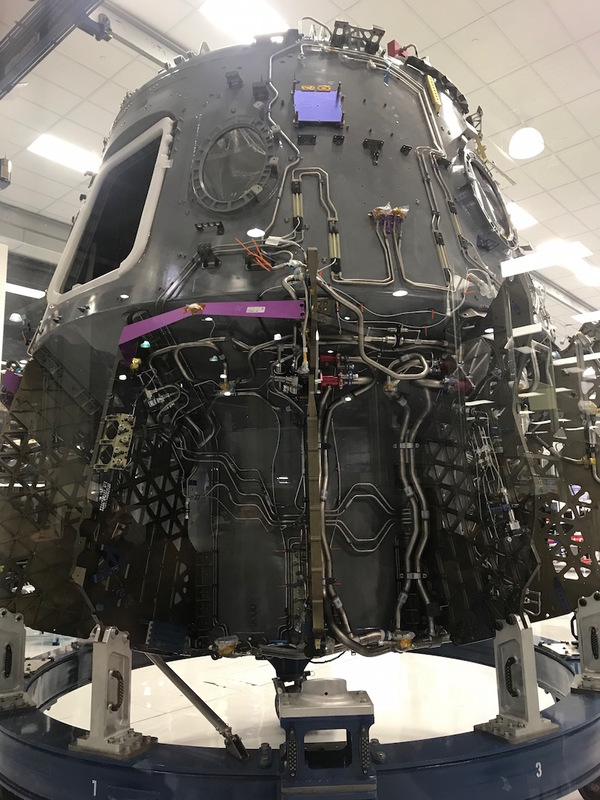 The Crew Dragon is not carrying any astronauts on the upcoming mission, known as Demo-1 or DM-1, but engineers will assess the performance of the new human-rated capsule on a planned six-day flight. Docking with the International Space Station is scheduled Sunday around 6 a.m. EST (1100 GMT), assuming an on-time launch Saturday, followed by departure and splashdown in the Atlantic Ocean off of east coast of Florida on March 8 around 8:45 a.m. EST (1345 GMT). “The task ahead of us is really historic,” said Hans Koenigsmann, SpaceX’s vice president of build and flight reliability. The Crew Dragon will become the first human-rated spacecraft to launch from the Cape Canaveral spaceport since the last space shuttle mission lifted off in 2011. SpaceX uses the same Apollo- and shuttle-era launch facility — pad 39A — and gave the launch complex a facelift over the last few years, and began launching cargo and satellite missions there in 2017, giving the company a second launch pad in Florida. SpaceX constructed a hangar, where Falcon 9 and Falcon Heavy rockets can be assembled, and stripped the launch pad of much of its shuttle-era equipment, including a rotating service structure no longer needed at the site. In August, ground teams installed a crew access arm, a boarding gate for astronauts. Finally, SpaceX painted the fixed tower black and added cladding, giving the historic pad a new look and providing additional protection from the seaside environment. NASA, SpaceX and Boeing — the agency’s other commercial crew partner — are on the precipice of launching astronauts. Boeing plans an unpiloted test flight — similar to the mission set for launch by SpaceX this weekend — later this spring, followed by crewed test flights by both companies later this year. The long-delayed Crew Dragon test flight will wring out the capsule’s systems, ranging from life support to propulsion, power, navigation, and safety technology. While it shares some design history with SpaceX’s Dragon cargo capsule, which has launched 18 times — including on a failed mission and two test flights — the Crew Dragon is essentially a new spacecraft. For the first time, SpaceX will fly a spacecraft with crew displays, seats, and the air revitalization system necessary to sustain crews during the trip from Earth to the space station and back. The Crew Dragon also carries a new docking system, a redesigned power generation system with body-mounted solar panels, an upgraded cooling system with a radiator, and new SuperDraco thrusters designed to propel the capsule away from an exploding rocket. SpaceX also added a crew hatch, and the Crew Dragon has a different outer mold line, giving it a different aerodynamic shape. 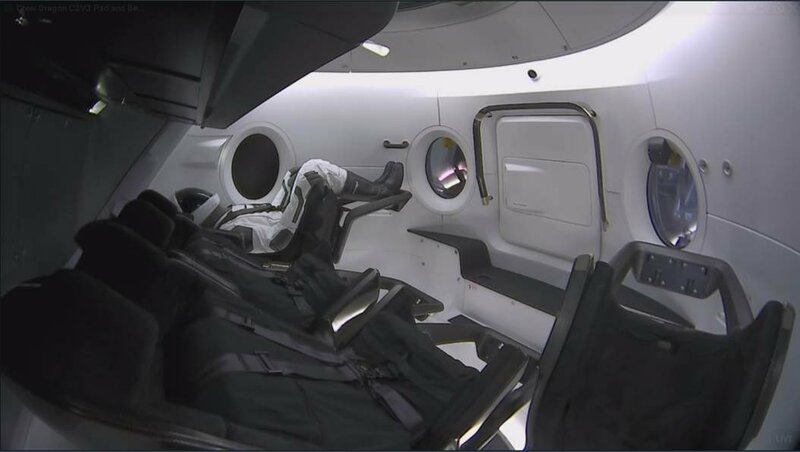 A spacesuit-clad anthropomorphic test device — which SpaceX officials prefer to call a “smarty” and not a “dummy” — is sitting in one of the four seats inside the Crew Dragon. SpaceX has named the mannequin “Ripley,” after Sigourney Weaver’s character in the “Alien” films. According to SpaceX, Ripley is fitted with sensors around its head, neck and spine to gather data on the environments astronauts will experience when they ride the Crew Dragon, beginning later this year on the capsule’s second test flight. Musk tweeted that cameras inside the spacecraft will provide views during the Crew Dragon’s trip to the International Space Station, including views from Ripley’s perspective, with cockpit display panels within reach. The start of regular crew rotation service by SpaceX and Boeing will allow NASA to stop buying seats for U.S. and partner astronauts on Russian Soyuz spacecraft, the only vehicle currently capable of carrying humans to space station. After completing their test flights, the SpaceX Crew Dragon and Boeing CST-100 Starliner spacecraft will ferry astronauts to and from the station for six-month stays, and remain docked at the research complex to serve as emergency lifeboats. NASA started paying companies to develop commercial crew vehicles in 2010. 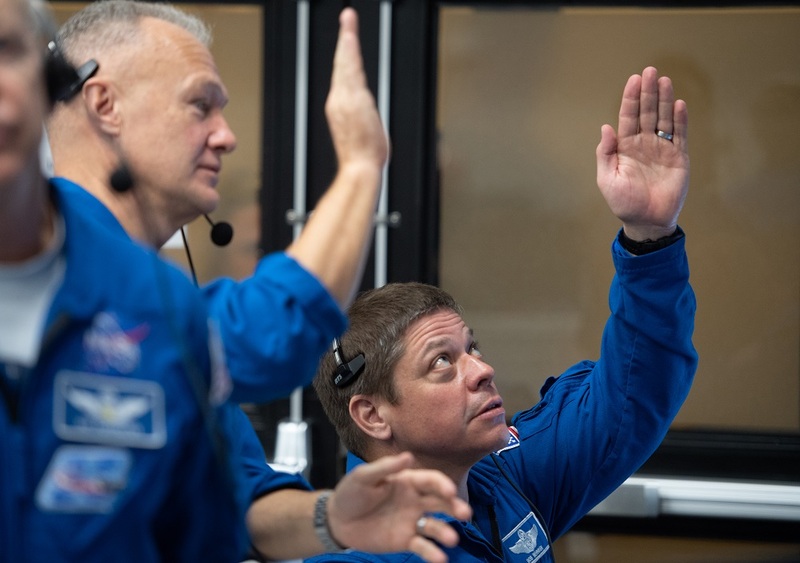 After several funding rounds, the space agency selected Boeing and SpaceX in 2014 to complete their human-rated Starliner and Crew Dragon capsules. At that time, SpaceX said the Crew Dragon’s unpiloted demonstration flight could be ready to take off by the end of 2016. After more than two years of delays, during which SpaceX redesigned the craft to return to Earth in the ocean rather than on land, the Crew Dragon is ready for blastoff Saturday. Through several funding agreements and contracts, NASA has paid SpaceX more than $3.14 billion over the last decade to work on the Crew Dragon spacecraft, human-rate the Falcon 9 launcher, and ready the company’s launch pad and control center for astronaut missions. Boeing has received $4.82 billion in that time to design, develop and test the Starliner spacecraft, which will lift off on United Launch Alliance Atlas 5 rockets and return to Earth with a airbag-cushioned landings in the Western United States, likely in New Mexico for the first test flights. The Starliner has also encountered delays, stemming from issues with the capsule’s aerodynamics, abort thrusters, and other issues. 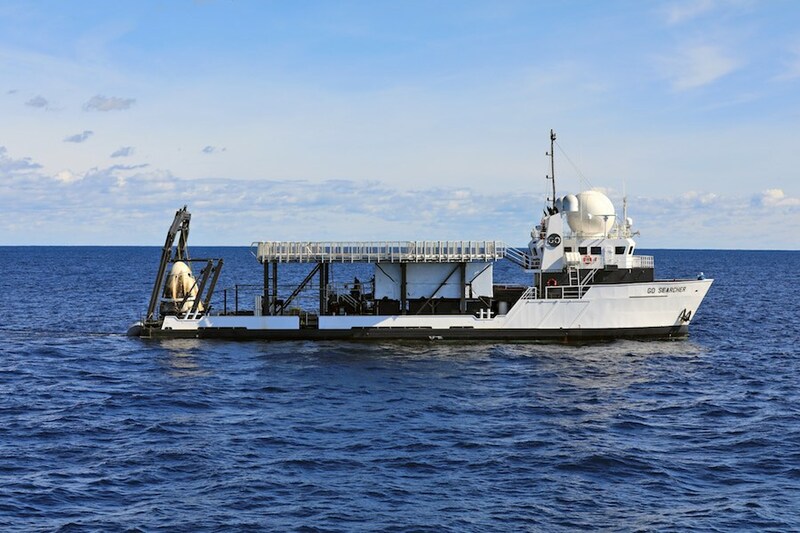 Once the Crew Dragon splashes down in the Atlantic — around 240 miles (390 kilometers) east of Cape Canaveral — a SpaceX recovery ship will retrieve the capsule from the sea and return it to port. SpaceX aims to reuse the capsule for an in-flight abort test, tentatively scheduled for June, to verify the performance of the ship’s escape engines. For the Demo-1 mission, the escape system is operating with reduced functionality to gather data. 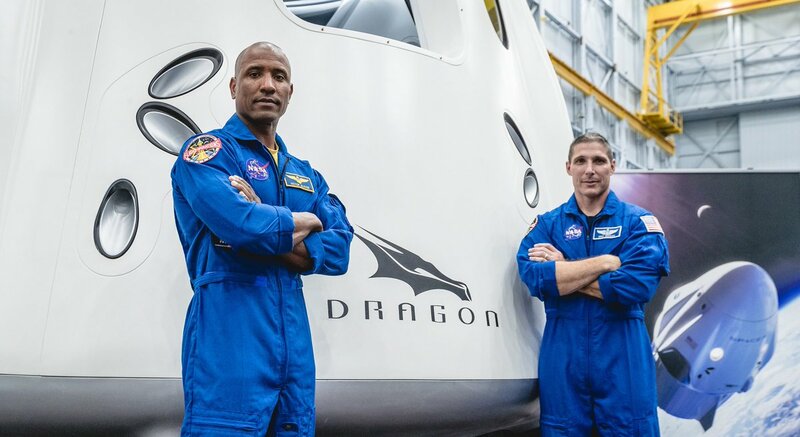 The second Crew Dragon test flight, with two NASA astronauts on-board, is planned as soon as July. But that’s a best-case scenario, and sources familiar with the program suggest the mission is likely to be pushed back until later in the year. SpaceX plans to retire its first-generation Dragon cargo capsule next year, and move all of its space station flights — carrying crew and supplies — to the new-generation Crew Dragon design. Under the terms of its contract with NASA, SpaceX also designed new sleek-looking spacesuit for astronauts riding on Crew Dragon. There’s still work to complete on qualifying the Crew Dragon’s four landing parachutes for crewed flights, and engineers are modifying part of the capsule’s propulsion system to address a vibration concern with the ship’s Draco thrusters. 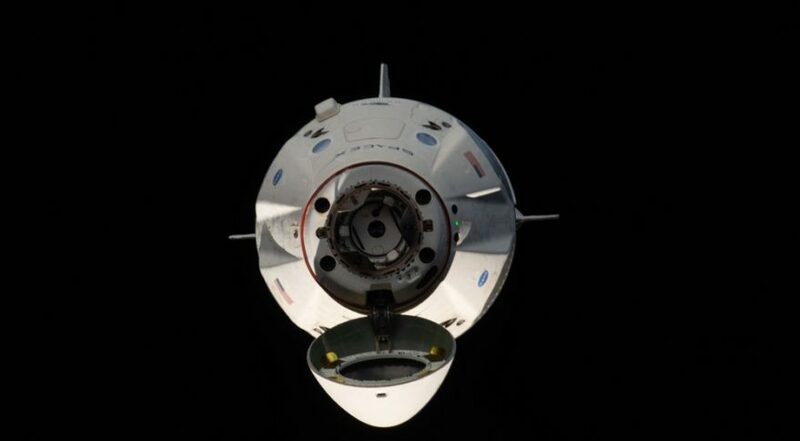 The station astronauts will have the ability to send the Crew Dragon away if it runs into problems during the rendezvous. The capsule will attempt SpaceX’s first docking with another object in space, targeting arrival at a new docking port delivered to the station by a SpaceX cargo capsule in 2016. One safety concern about the docking voiced by Russian officials at a readiness review last week as closed out Wednesday, according to Montalbano. Russian engineers were concerned that the Crew Dragon does not have an independent command chain to safely fly away from the station if it suffers a total computer failure during the final approach for docking. Montalbano said NASA assuaged Russian worries by instructing the space station crew to close hatches inside the complex during Crew Dragon’s rendezvous, allowing the astronauts to quickly seal off any air leak in the event of a collision. The station crew will also have a clear path to their Soyuz return craft to evacuate if necessary. 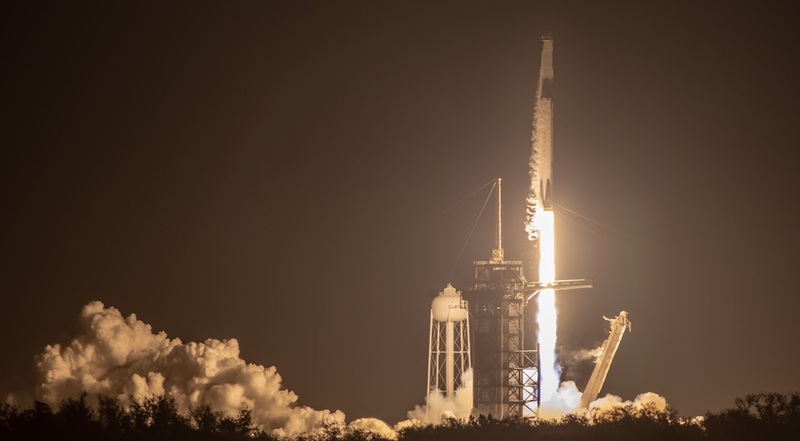 KENNEDY SPACE CENTER, Fla. — A SpaceX Falcon 9 successfully launched the first Crew Dragon spacecraft March 2, starting a critical mission to test the spacecraft before it is ready to carry astronauts. The Falcon 9 lifted off on the Demo-1 mission from Launch Complex 39A at 2:49 a.m. Eastern after a problem-free countdown. The Crew Dragon spacecraft separated from the rocket’s upper stage 11 minutes after liftoff. The spacecraft is en route to the International Space Station, with a docking expected about 27 hours after liftoff. The spacecraft will remain docked at the station until early March 8, splashing down in the Atlantic Ocean off the Florida coast several hours after undocking. At a post-launch press conference here, SpaceX Chief Executive Elon Musk confirmed that the spacceraft was working as expected in orbit. That included opening the nose cone of the spacecraft to expose its docking port and firing several of its Draco thrusters. “So far everything looks good,” he said. NASA concurred. “The flight’s going great so far,” said Steve Stich, NASA commercial crew deputy program manager. 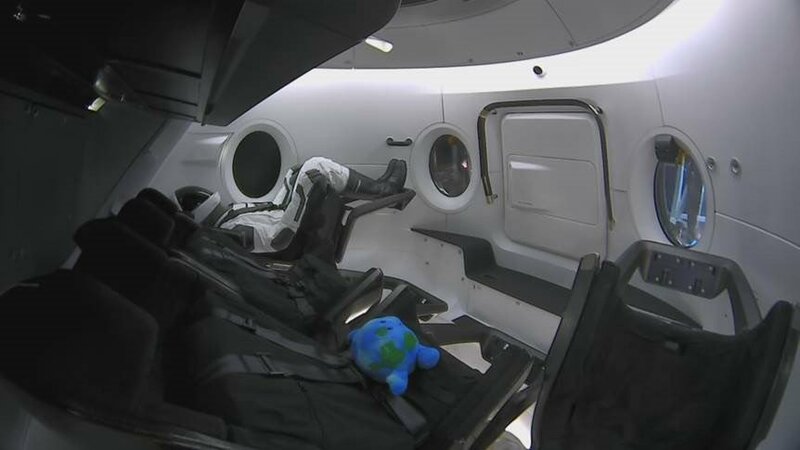 The Crew Dragon is not carrying astronauts, but does have on board an instrumented mannequin named “Ripley” wearing a SpaceX pressure suit. 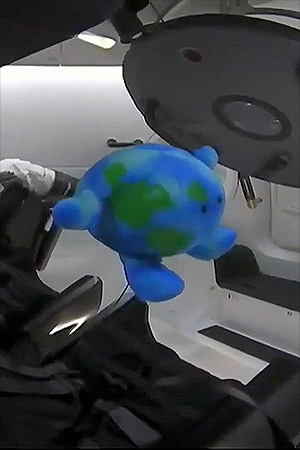 Elon Musk tweeted late March 1 that there was also a “super high tech zero-g indicator” onboard: a plush toy resembling the Earth, sitting on one of the seats inside the capsule. Demo-1 is the first of two test flights of Crew Dragon as part of SpaceX’s commercial crew contract with NASA. The flight is intended to test key subsystems on the spacecraft and identify problems that will need to be corrected before NASA approves flying its astronauts on the spacecraft. Those milestones include testing Crew Dragon as it approaches and docks with the station and, later, its reentry and splashdown. This mission will mark the first time a Dragon spacecraft has docked with the station, as previous cargo Dragon spacecraft were berthed by the station’s robotic arm. The second test flight, Demo-2, will carry NASA astronauts Bob Behnken and Doug Hurley. 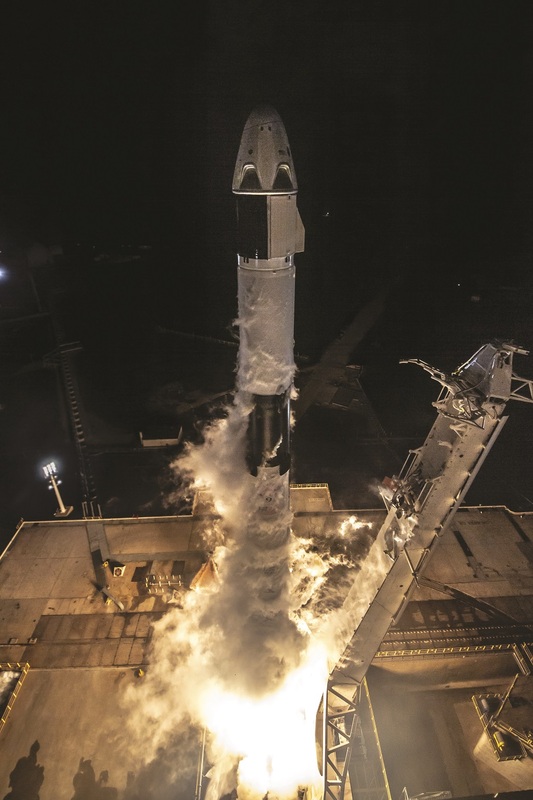 That mission is scheduled for no earlier than July, although agency leaders emphasized before the Demo-1 launch that they will not rush the launch of Demo-2 to meet a certain schedule. That’s one reason, he said, that NASA is moving ahead with a proposal to buy two Soyuz seats from the Russian state space corporation Roscosmos to ensure a U.S. presence on the station well into 2020. NASA stated its intent to buy those seats from Roscosmos in a Feb. 13 procurement filing. Both Geyer and Bob Cabana, director of the Kennedy Space Center, said they were still confident that either Boeing or SpaceX, or both, would be ready to fly crews before the end of this year, when NASA’s access to Soyuz seats other than the two it seeks to purchase runs out. “There’s a lot that we have to do before we can certify both these vehicles to fly humans to space, but I think it’s a definite possibility, and I’m confident we’ll get one of them up there with crew before the end of the year,” said Cabana, adding he felt there was a “better than 50 percent chance” of doing so. Behnken and Hurley were here for the launch and came away pleased. “Seeing a success like this definitely gives us a lot of confidence in the future,” Behnken said. America’s decade-long effort to develop commercial vehicles to restore U.S. crew access to the International Space Station (ISS) following the retirement of the Space Shuttle fleet drew one step closer to fruition earlier this morning (Saturday, 2 March), when a SpaceX Falcon 9 booster roared aloft from historic Pad 39A at the Kennedy Space Center (KSC) in Florida. Laden with “Demo-1”, an unpiloted test-flight of the Crew Dragon spacecraft which will henceforth ferry U.S. astronauts and international partners to the ISS, the mission took flight at 2:49 a.m. EST and is presently targeted to dock autonomously at International Docking Adapter (IDA)-2, on the forward end of the station’s Harmony node, on Sunday morning. As detailed in AmericaSpace’s two-part Crew Dragon preview/history feature it has been a long and tortured journey to bring SpaceX from an initial Round 2 winner of funding under the Commercial Crew Development (CCDev) initiative, way back in April 2011, to becoming a contract recipient of the Commercial Crew integrated Capability (CCiCap) in August 2012 and eventually, alongside Boeing, beginning the actual effort to develop, build and certify its spacecraft under the Commercial Crew transportation Capability (CCtCap) agreements in September 2014. Efforts to get SpaceX’s Crew Dragon and Boeing’s CST-100 Starliner airborne, originally by late 2017, ultimately proved impossible, due to technical issues and Congressional underfunding. This required NASA to continue contracting with Russia for seats aboard its venerable Soyuz spacecraft, to ensure continued U.S. crew access to the ISS during the longest “gap” in American human spaceflight capability in history. By the time the first piloted Crew Dragon launches, possibly as soon as July 2019, a full eight years will have elapsed since the final shuttle flight back in July 2011. The previous longest gap was five years and nine months, before Apollo-Soyuz in July 1975 and the first flight of the shuttle program in April 1981. Notwithstanding these many delays, in early January 2019 the 230-foot-tall (70-meter) Upgraded Falcon 9 was transported from its Horizontal Integration Facility (HIF) to historic Pad 39A, which to date has seen more than a hundred launches, comprising all but one of the Apollo lunar voyages, seen off dozens of shuttle crews—including the first in April 1981 and the last in July 2011—and a raft of SpaceX commercial missions, notably last year’s inaugural flight of the Falcon Heavy. On 24 January, the Upgraded Falcon 9’s nine Merlin 1D+ first-stage engines ignited in a customary Static Fire Test, lasting just a handful of seconds, to complete a significant hurdle ahead of launch. The booster was then returned to a horizontal configuration and transported back to the integration facility. At that time, liftoff of Demo-1 was provisionally targeted for no sooner than 23 February, although a subsequent NASA update confirmed 2 March as the projected launch date. This was confirmed last week at the conclusion of the NASA-SpaceX Flight Readiness Review (FRR). 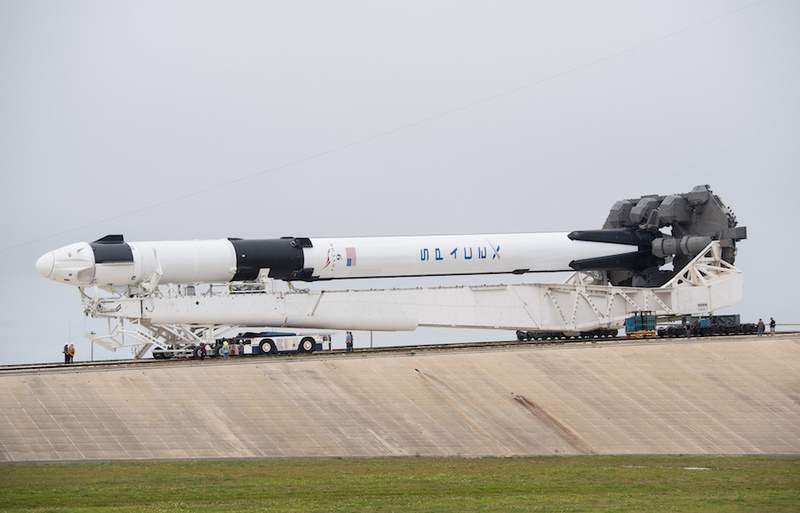 A final Launch Readiness Review (LRR) on Wednesday, 27 February produced a definitive “Go for Launch” and on Thursday the Falcon 9—with the Demo-1 Crew Dragon spacecraft sitting, bullet-like, at its tip—was returned to Pad 39A for final pre-flight preparations. For the opening launch attempt in the wee hours of Saturday, the USAF 45th Space Wing at Patrick Air Force Base identified an 80-percent likelihood of acceptable conditions, so both SpaceX and NASA teams aimed confidently for Saturday morning’s opening attempt. 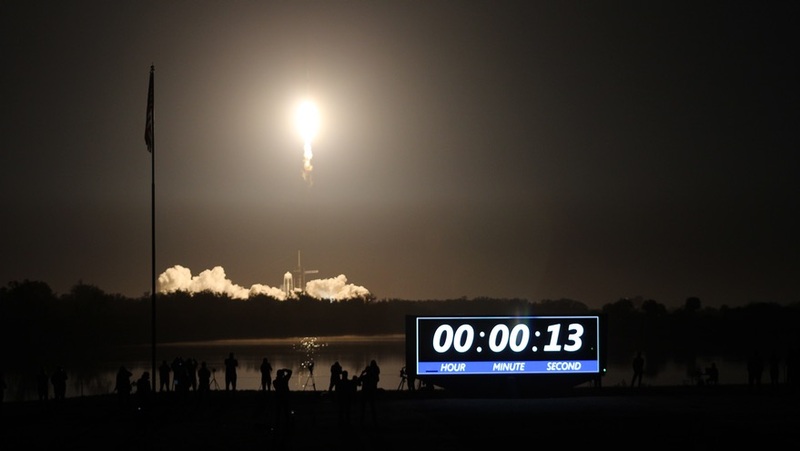 Liftoff occurred on time at 2:49 a.m. EST, piercing the middle-of-the-night stillness at KSC. SpaceX controlled the launch of the Falcon 9 rocket from Kennedy’s Launch Control Center Firing Room 4, the former space shuttle control room, which SpaceX has leased as its primary launch control center. As Crew Dragon ascended into space, SpaceX commanded the Crew Dragon spacecraft from its mission control center in Hawthorne, California. NASA teams will monitor space station operations throughout the flight from Mission Control Center at the agency’s Johnson Space Center in Houston. Two minutes into the flight, the rocket’sfirst-stage core separated from the rapidly-ascending stack and commenced its descent to a smooth touchdown on the Autonomous Spaceport Drone Ship (ASDS), nicknamed “Of Course I Still Love You”, situated offshore in the Atlantic Ocean. It was SpaceX’s 23rd successful droneship landing in 25 attempts since April 2016. Having shed its first stage, the Upgraded Falcon 9’s second stage—powered by a single Merlin 1D+ Vacuum engine—continued uphill, delivering the Demo-1 spacecraft directly into low-Earth and onto a single-day, 18-orbit approach and rendezvous profile. 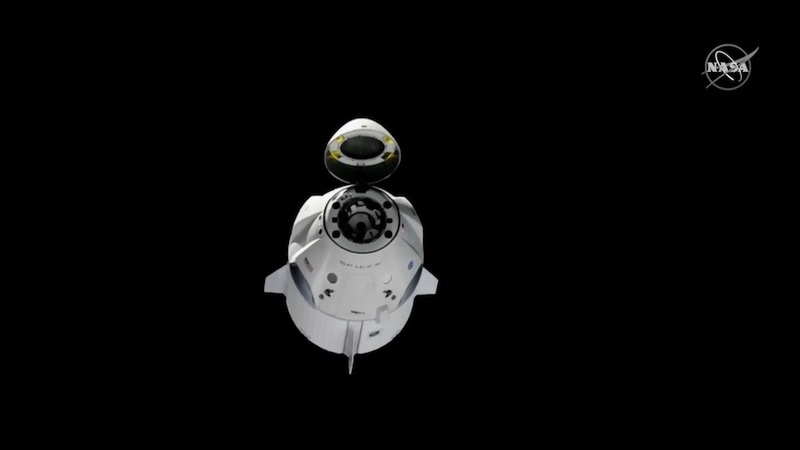 Twelve minutes into the flight, Crew Dragon’s protective nosecone was opened, revealing its docking mechanism. 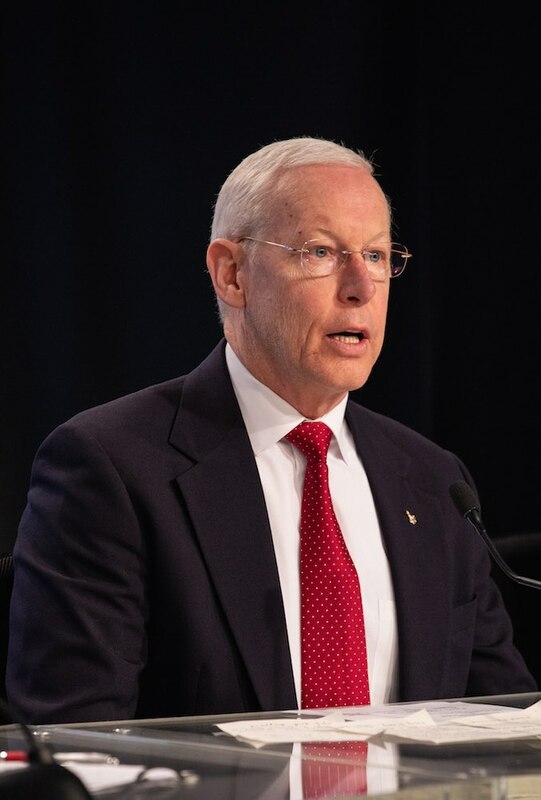 As outlined by NASA Associate Administrator for Human Exploration and Operations William Gerstenmaier at the post-FRR media conference on 22 February, the single-day rendezvous has been designed to best accommodate in-flight thermal constraints on the Crew Dragon. However, NASA’s Dan Huot told AmericaSpace that rendezvous profiles for both Crew Dragon and Boeing’s CST-100 Starliner on subsequent missions are “expected to be shorter” and certainly “faster than 24 hours”. Rendezvous will carry some similarities and some differences from previous unpiloted cargo Dragon missions. Those flights typically approached the station from “below”, along the so-called “R-Bar” (“Earth Radius Vector”), which allowed them to utilize natural gravitational forces and braking and reduced the need for excessive thruster firings. During its five days linked to the space station, Crew Dragon will be subjected to external photo-documentation, via Canadarm2, and internal inspections by the Expedition 58 team, who will focus specifically upon its habitability and the condition of its windows. 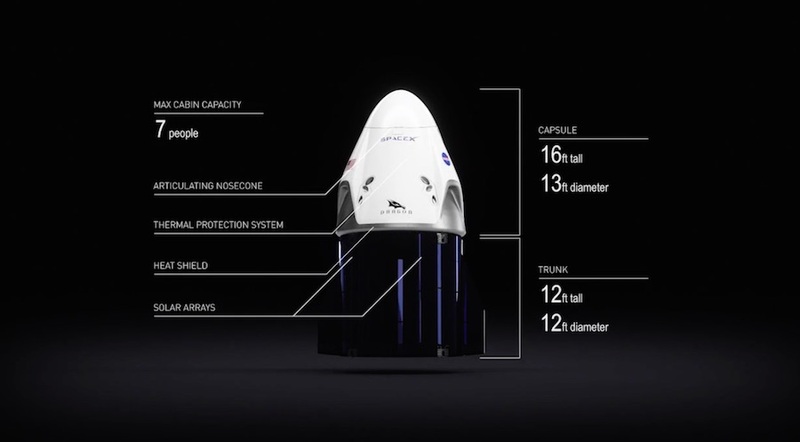 Some 400 pounds (180 kg) of supplies and equipment are aboard, packed behind the Crew Dragon’s seats in a designated cargo area. This comprises a set of radiation monitors, together with cold bags for returning science specimens and assorted crew supplies, which include clothes, hygiene items and food for Kononenko, Saint-Jacques and McClain. Assuming an on-time docking, hatch closure will occur around midday EST on Thursday, 7 March, after which the spacecraft will undock from the ISS at about 2:30 a.m. EST on Friday 8th. It will perform a deorbit burn several hours later, with a targeted splashdown point in the Atlantic Ocean, a couple hundred miles off Florida, at around 8:45 a.m. EST. As described by Mr. Gerstenmaier, the early-hours landing is dictated in part by the requirement for adequate lighting conditions at the splashdown point, to enable satisfactorily observation of parachute deployment and Crew Dragon recovery operations. International Space Station on Sunday, March 3, 2019. WASHINGTON — SpaceX’s Crew Dragon departed from the International Space Station early March 8, splashing down to mark the end of a successful test flight for the commercial crew program. The Crew Dragon spacecraft, flying a mission designated Demo-1, undocked from the station’s Harmony module at 2:32 a.m. Eastern. It quickly moved away from the station as in preparation for its return to Earth. The spacecraft fired its thrusters at 7:53 a.m. Eastern for a 15-minute reentry burn. That reentry appeared to go as planned, with the spacecraft first deploying two drogue parachutes followed by its four main ones. The spacecraft splashed down in the Atlantic Ocean at 8:45 a.m. Eastern within sight of SpaceX recovery ships. The spacecraft launched from the Kennedy Space Center in Florida March 2, docking with the station 27 hours later after a problem-free approach. The station’s crew spent several days monitoring the spacecraft while docked to the station before closing hatches between the station and spacecraft March 7. NASA’s current schedule calls for an in-flight abort test of Crew Dragon, using the same capsule as flown on Demo-1, in June. That will be followed as soon as July as Demo-2, carrying NASA astronauts Bob Behnken and Doug Hurley. Even before the launch, though, NASA officials cautioned that there was still some work to do on Crew Dragon before it would be ready to carry astronauts. They still hoped that a crewed test flight could take place before the end of the year but did not commit to a specific schedule. She added that she and the rest of the panel were pleased that NASA was taking steps, such as buying two additional Soyuz seats from Roscosmos, to alleviate any perceived schedule pressure on the commercial crew program. “We think both providers, and NASA, are doing the right things in a very deliberate fashion to get to the point where we can say, ‘yea, verily, let’s launch some people,’ which we are all eagerly awaiting,” she said. Slowed by four orange and white parachutes, the gumdrop-shaped spaceship splashed down in the Atlantic east of Florida at 8:45 a.m. EST (1345 GMT) Friday, and SpaceX and NASA teams stationed nearby sped toward the capsule, removed a parachute that fell onto the craft after the ocean landing, and readied the Crew Dragon for retrieval. Around an hour after splashdown, ground crews hoisted the spacecraft onto SpaceX’s “Go Searcher” recovery vessel, where the Crew Dragon was expected to be moved into a hangar for the trip back to the Florida coast. The textbook splashdown Friday punctuated a seemingly picture-perfect mission, a precursor to NASA’s plans to resume astronaut launches on U.S. spacecraft to the International Space Station later this year. Since the last space shuttle landed in 2011, NASA astronauts have rode to space and back aboard Russian Soyuz ferry ships. Officials from NASA, which has paid SpaceX more than $3 billion since 2010 to develop the Crew Dragon spacecraft, agreed with Reed’s preliminary assessment. “I don’t think we saw really anything on the (Crew Dragon test flight) mission so far — and we’ve got to do the data reviews — that would preclude us having the crewed mission later this year,” said Steve Stich, deputy manager of NASA’s commercial crew program. The six-day test flight — known as Demo-1, or DM-1 — was a crucial forerunner before a second orbital test flight — Demo-2, or DM-2 — blasts off with NASA astronauts Bob Behnken and Doug Hurley on the next Crew Dragon spacecraft later this year. The Crew Dragon capsule for the Demo-1 mission launched March 2 atop a SpaceX Falcon 9 rocket rocket from NASA’s Kennedy Space Center in Florida, and reached the space station March 3 with a successful automated docking, the first fully automated link-up with the space station by a U.S. spacecraft. 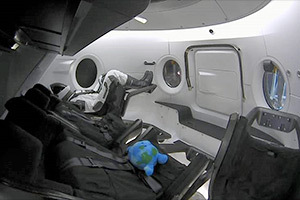 There were no astronauts on-board, but the Crew Dragon carried an instrumented test dummy named “Ripley,” a nod to the protagonist from the “Alien” film franchise. Ripley rode in one of the Crew Dragon’s four seats, and sensors in the mannequin’s head, neck and spine collected measurements on the g-forces and other conditions astronauts on the ship will experience. 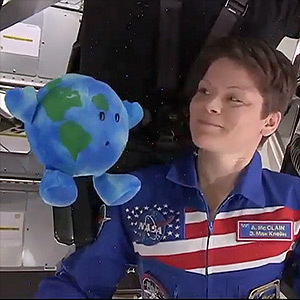 A plush Earth toy also launched inside the Crew Dragon and earned adoration from the space station’s crew, who kept the “Little Earth” inside the orbiting science lab after the SpaceX capsule departed Friday. 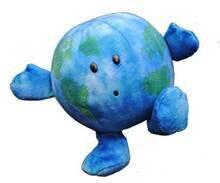 Behnken and Hurley will bring “Little Earth” back home on their test flight. 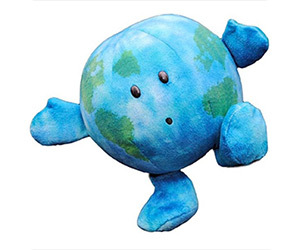 Yes buddy, that’s your Mother Earth. Isn’t she beautiful? The Crew Dragon ferried nearly 450 pounds (204 kilograms) of equipment to the space station — mainly crew supplies — and astronauts planned to pack around 328 pounds (148 kilograms) of hardware and scientific specimens into the capsule’s pressurized cabin for the trip back to Earth. 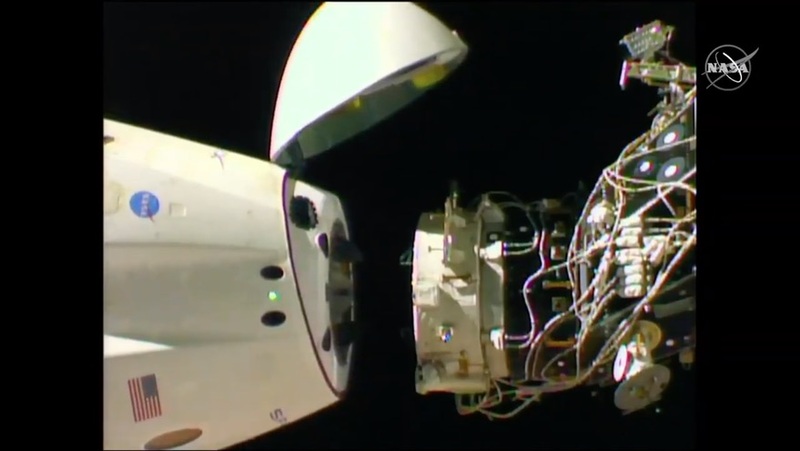 Canadian flight engineer David Saint-Jacques and NASA astronaut Anne McClain closed hatches leading to the Crew Dragon spacecraft Thursday, setting up for the ship’s undocking from the forward port of the station’s Harmony module at 2:31 a.m. EST (0731 GMT) Friday. The craft fired its Draco thrusters to back away from the space station, then accomplished several additional departure burns to fly a safe distance from the complex in preparation for landing. The capsule jettisoned its rear trunk at 7:48 a.m. EST (1248 GMT), leaving the power module behind in orbit as the crew return craft ignited its Draco thrusters again at 7:52 a.m. EST (1252 GMT) for a 15-minute, 25-second braking burn. The impulse from the deorbit burn slowed the capsule’s velocity enough to drop its orbit into the atmosphere, allowing friction from air particles to bring the Crew Dragon back to Earth. After closing a protective nose cone over its docking port and hatch, the capsule encountered the first traces of the atmosphere at 8:33 a.m. EST (1333 GMT) as it flew on a northwest-to-southeast track over the United States, and temperatures outside the Crew Dragon built up to thousands of degrees. The chutes appeared to work normally Friday, and live video beamed from the splashdown zone showed the capsule — its heat shield blackened from the fiery re-entry — descending under a morning sun before splashing down more than 250 miles ( 400 kilometers) northeast of Cape Canaveral, roughly due east from the Florida/Georgia border. 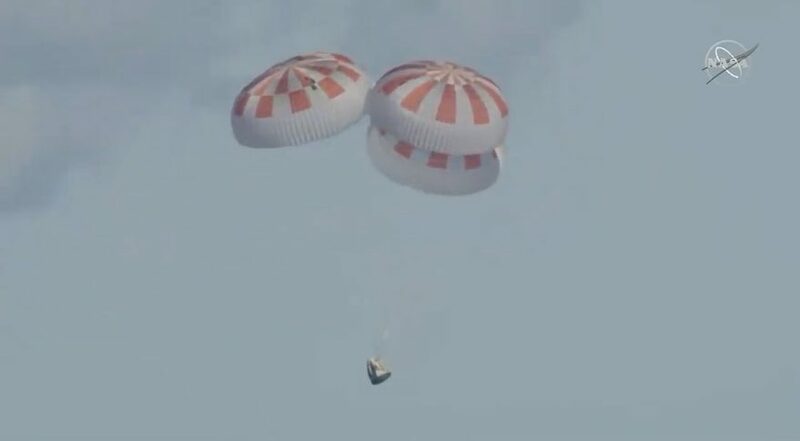 “All of these gazillions of tests that we’ve been doing on parachutes, all of the analysis and work that we’ve done on understanding the aerodynamics of re-entry and coming home, everything was just wonderful,” Reed said after the splashdown. “It was a great dress rehearsal for Demo-2 (the crew test flight),” Stich said. “We learned a phenomenal amount in the pre-launch timeframe, about how to load the vehicle, and thinking forward to how we’ll put the crews in the vehicle. The ascent profile for this flight, we practiced the exact profile that (astronauts) will fly very soon. We had the abort system, the crew escape system in Dragon, actually enabled for this flight, and we were able to see how that worked, and we’ll get the data back and look at those triggers and how it performed. 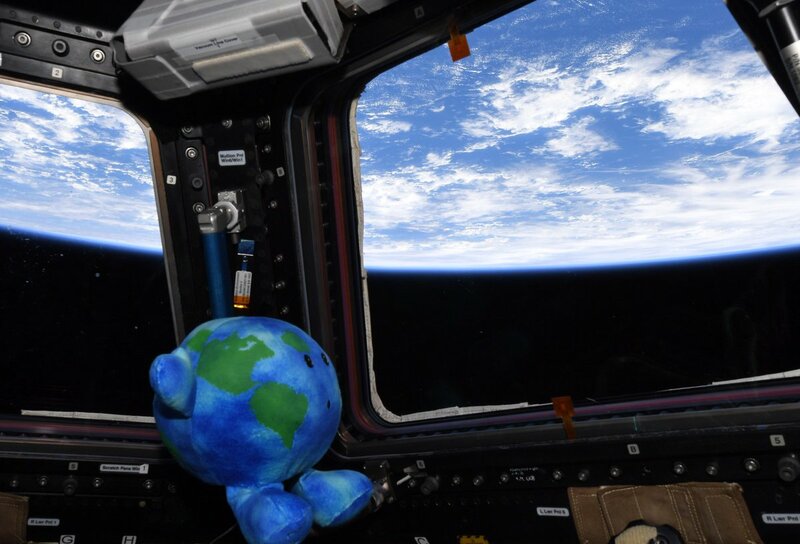 The return trip from the space station went just as well, Stich said. Weeks of data reviews lie ahead for NASA and SpaceX engineers to analyze the results of the Crew Dragon test flight in more detail. SpaceX will refurbish the Crew Dragon capsule that returned to Earth on Friday for an in-flight abort test scheduled for June. The abort system trial will verify the Crew Dragon’s eight SuperDraco thrusters can safely push the capsule away from an exploding launcher in flight, using a modified Falcon 9 booster to reach supersonic speed in the stratosphere before triggering the escape maneuver. Meanwhile, workers at SpaceX headquarters in Hawthorne, California, continue assembling the Crew Dragon spacecraft for the test flight with astronauts. Assuming the data reviews, the high-altitude abort test, and unresolved technical issues are completed in the coming months, Behnken and Hurley could strap into the next Crew Dragon spacecraft as soon as July, according to the most recent schedule officially published by NASA. 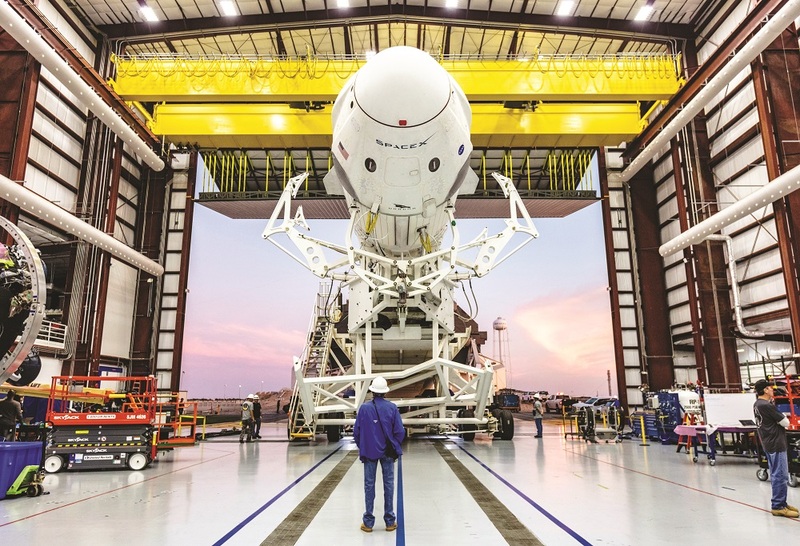 In their comments this week during the Crew Dragon’s test flight, NASA and SpaceX officials did not commit to the July timetable for the demonstration launch with astronauts. 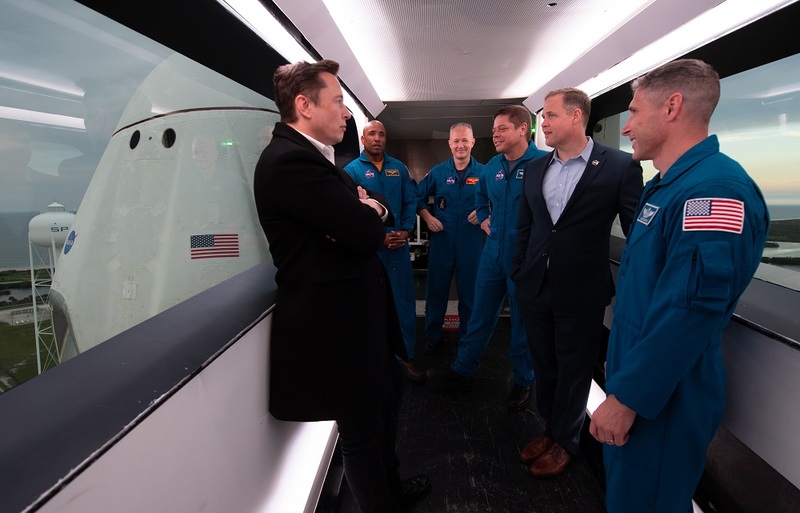 But top managers, including NASA Administrator Jim Bridenstine, said they were confident a commercial capsules developed by SpaceX or Boeing will be ready for a human spaceflight before the end of this year. 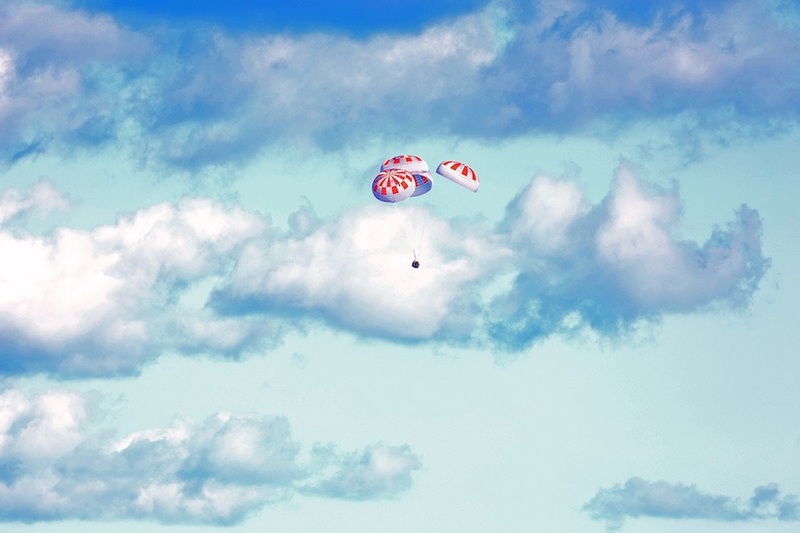 NASA says SpaceX still must complete further testing of the Crew Dragon’s parachutes before astronauts can ride the spacecraft. Engineers may need to install heaters in propellant lines leading to the capsule’s Draco thrusters to address a concern that cold fuel could cause a shock and damage the control jets. SpaceX kept the hydrazine and nitrogen tetroxide propellants warm on the unpiloted test flight my pointing certain parts of the spacecraft toward the sun. NASA will likely desire a more permanent solution before astronauts get the green light to fly. 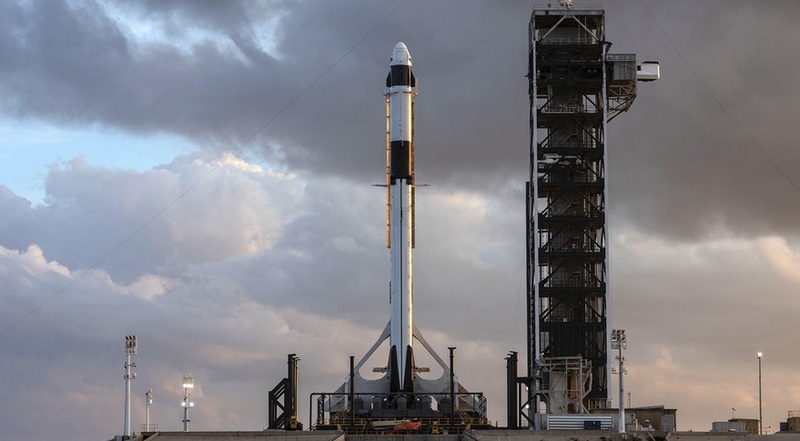 Engineers are also still studying the safety of carbon overwrapped pressure vessels inside the Falcon 9 rocket and the Crew Dragon spacecraft, officials said before last week’s launch. The vessels on the Falcon 9 rocket contain helium to pressurize the launcher’s propellant tanks. SpaceX began flying a redesigned helium reservoir last year with fixes to avoid a problem that led to friction in the fibers on the outside of one of the vessels, causing a spark inside an oxygen tank that destroyed a Falcon 9 rocket and a commercial communications satellite during a pre-launch test in 2016. Boeing’s CST-100 Starliner crew capsule, which is also primarily funded through a multibillion-dollar NASA contract, is scheduled to lift off on a United Launch Alliance Atlas 5 rocket later this year for an unpiloted test flight to the space station, similar to the mission just concluded by SpaceX. The most recent schedule released by NASA indicates the first Starliner test flight could launch as soon as April. However, that is widely expected to be delayed until some time this summer, at the earliest, as Boeing engineers contend with their own technical issues. Once the Crew Dragon and Starliner spaceships complete their test flights, NASA plans to use the capsules to transport astronauts to and from the space station in six-month increments, ending the agency’s sole reliance on Russia’s Soyuz spacecraft. Bridenstine, the NASA administrator, lauded government leaders for keeping the agency committed to commercializing human spaceflight operations in low Earth orbit, an initiative begun under the George W. Bush administration for cargo services, then expanded by President Barack Obama in 2010 for crews. “This really is an American achievement that spans many generations of NASA administrators, and in fact, over a decade of work by the NASA team,” Bridenstine said. Some in Congress pushed back against NASA’s efforts to turn over crew transportation to the commercial sector, preferring to maintain government control and slashing the program’s budget below what the agency said it needed. The funding shortfall, coupled with engineering redesigns and development issues, led the first commercial crew test flights to be delayed from 2015 until this year. The delays have forced NASA to continue purchasing Soyuz seats from the Russian government for years longer than officials hoped. NASA is considering an option to buy two more Soyuz seats, covering launches and landings through September 2020, to hedge against further delays in the SpaceX and Boeing crew programs. “It seems like we lurch from one administration to the next, and changing visions and changing budgets,” Bridenstine said Friday. “How do we keep constancy? Well, this is a perfect example of a program. When we talk about these things that NASA does, it takes, in many cases, decades to achieve this kind of capability, and the constancy of purpose here for all of these years is important.